I prefer reviewing full series after they're done, but I've just seen the 9 episodes of "Littlest Pet Shop" that are out so far and decided to share my thoughts. So... let's take it from the top! Series name - "Littlest Pet Shop"
It's a 2012 animated TV series created by Hasbro to go with the pre-existing toy line sharing the same name. The first episode premiered on November 10th and new episodes are shown on a weekly basis on Hasbro's own channel - The Hub. It's produced by DHX Media's animation studio in Vancouver, just like My Little Pony: FiM and Pound Puppies. (More info on the wiki page). Gotta hand it to the creative team - with just a few very subtle tweaks they've really toned down the "creepy" and made the extremely top-heavy animals a bit more believably-mobile. So we know what it looks like. How does it animate? First off, let me point out that the voice acting is wonderful. Now then, the animals are actually a treat to watch! Surprisingly fun and natural movement. The humans, on the other hand, move in a very stiff and lifeless manner, like shadow puppets and show nearly expressionless faces. No doubt, the visual storytelling suffers so much because it's a girls' show and everyone "has to look pretty". Nothing too elaborate here. Blythe's the protagonist and she works at the pet shop. She's an aspiring fashion artist/dress-maker and makes outfits for the pets. I'd guess she's in her early teens. After landing on her head from a considerable height in the very first episode she's gained the talent of communicating with animals. The episodes tend to focus separately on Blythe's social life and what the silly technicolor animals are up to in her absence. Sounds scary so far. While our protagonist isn't a girly fashion-obsessed bimbo as such, but more of a creative, geeky semi-outcast and is at very least bearable, there's no denying it's a girly show that doesn't have a great deal to offer to anyone who isn't a girl aged between, I'd say, 10 to 14. The advertising campaign for it was geared towards fans of My Little Pony, as we can see in this promo, which shows Blythe as a whacky chick, who's cool enough to hang with Dashe. I'm sure it got some attention from bronies, but will they stay? At this point, I very much doubt it. These pets got nothing on ponies. While the LPS does have a few things going it's way, it's slow-paced, the pop culture references are there, but very few. There's a whole lot of girliness to put up with. The animals are meant to be fun and, I assume, entertaining for younger kids, while being cute enough for older girls. I mostly found them eating away at my patience. You can tell that most of the characters are still "flat" and need plenty of work done on their personalities. The stories are very predictable. I found myself mostly waiting for obvious bits to be over, rather than anticipating a plot twist. Also, has anyone else noticed this paradox? Shows geared towards older kids/young teens tend to be extremely primitive compared to the ones meant for younger children and their parents. LPS illustrates this vividly I'm afraid. Littlest Pet Shop is a so-so cartoon that might develop into something worth watching, considering the talented staff involved who are just getting started. Right now though, if you're not a somewhat girly girl aged around 10-14, you might find it boring. The good: The voice acting is beautiful. There's some top-notch clever comedy buried under the layer of "dull". Minka the spider monkey is actually really fun, expressive and surprisingly well-balanced as a character, who's also animated exceptionally well. While being pink and hyper, she's neither girly nor annoying. She really livens up the pet shop. The show has token goths amongst its background characters, at least one of which has a hilariously unfitting job at an ice cream shop. (It amused me. I'm calling it a plus). While not a masterpiece, this isn't nearly as dumb as "Bratz" and the like. The bad: The humans are far beyond the proverbial "zombie line". There isn't enough going on in the episodes. Zoe's face is begging for a punch. Hasbro's idea-recycling ways are quite apparent. 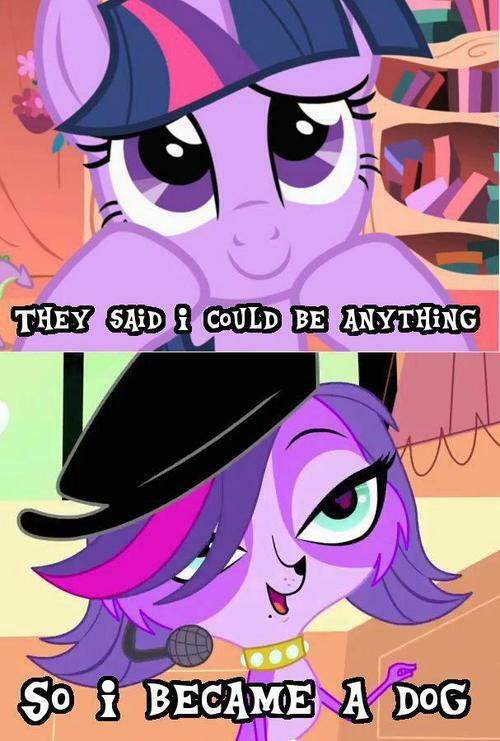 Plenty is taken from My Little Pony. The odd: Pepper the skunk starts to smell when she's emotional. The scent serves as a mood indicator. She stinks if she's unhappy, she smells like perfume when she's cheery and leaves dark magenta mist instead of the foul green one in such cases. Apparently, green geckos have hair. The style bears a faint but unmistakable resemblance to "Happy Tree Friends". Blythe has a different outfit in every episode and seems to be the only character to do so. Just for fun, to all you bronies. Blythe is Twilight Sparkle with Rarity's dressmaking talents and Fluttershy's ability to talk to critters. Minka the spider monkey is Pinkie Pie. Even her colour scheme is mostly preserved. Her party-throwing talent is swapped for one in modern art. The fourth wall breaking abilities remain intact. Zoe the dog is annoying. She's also got Rarity's personality, minus the talent and all redeeming qualities. In addition to that, she's stolen Twilight Sparkle's colour scheme. Penny Ling the panda is Fluttershy. Talent changed from "the stare" to rhythmic gymnastics. The rest of the characters seem suspiciously underdeveloped. Isn't that an interesting coincidence! (Okay, I'm kidding. At least I hope I'm not onto anything here).